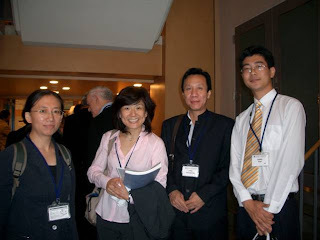 Here are 2008 events related to topics of interest - peace, sustainability, and education. These are events that I either organize, co-organize, participate, or am involved with in some capacity, either as an individual or representing Peace Philosophy Centre. Details of these events are subject to change. The newest event is at the top of the list. Please email info@peacephilosophy.com for more information. We will invite series of mini-presentations (5-10 minutes each) of local and global peace initiatives. Presentations, demonstrations, music and art performances are most welcome. Please bring a dish to share. Children are welcome. Email info@peacephilosophy.com for more information. * Vancouver Save Article 9 is hosting a workshop on November 9th. Satoko will be one of the panelists. Satoko will present her experience of working with progressive Japanese people and organizations in supporting victims of Japanese atrocities in Asia, with a group of teachers and BC ALPHA volunteers. * Satoko will be presenting a paper at a special interest session "Citizens Creating Spaces for Peace," and also speaking at the presentation of Hiroshima/Nagasaki Peace Tour by Ritsumeikan University and American University. * Satoko is presenting on Article 9 of Japanese Constitution in the afternoon session of September 21st. Email info@peacephilosophy.com for the special invitation for UBC students to join this tour. 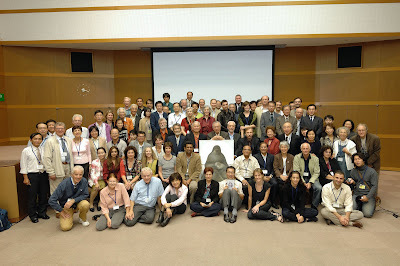 * Peace Philosophy Centre is a supporting organization for the Global Article 9 Conference to Abolish War. * "A-Boms and Humaniry" panels will be displayed at the theatre, with cooperation by Vancouver Save Article 9. Free Admission. Donation to cover the cost of rental and photocopying will be accepted. The 6th International Conference of Museums for Peace was held at Kyoto and Hiroshima from October 6th to 11th, 2008, with the involvement of more than 3,000 people. Here is a group photo with most of the international delegates. The regions represented in this photo included Viet Nam, Italy, China, the United States, Spain, Guatemala, Pakistan, India, Korea, Cambodia, Canada, Rwanda, Belgium, Netherlands, Switzerland, U.K., and Japan. A detailed report is on the way. Today I just wanted to share with you this photo of the peaceful and friendly international community.